Although our mother Church is in great problem, most of us tend to argue about some points only, one of which is Mahibere Kidusan. For the Church's sake, please limit all your comments about Mahibere Kidusan here. Positive, negatives or questions about MK should and must be posted here. Please be civil!!! The burning issue for Deje Selamaweyan should be what we should do untill Tikimt. We will re bring that topic to the forfront. የሀገር ፍቅር ራዲዮ - አለመታደል! አገር ቤት ከርሜ መጣሁ። መቼም የኛ ነገር ”መለያየት ሞት ነው” ሳይሆን ”መለያየት ሕይወት ነው” የተባለ ይመስል ”መለያየት መለያየት አሁንም መለያየት” ሆኗል ሥራችን። ለምሳሌ ስሙን ”አንድነት” ብሎ የሰየመው ፓርቲ ወደ መለያየት እያመራ መሆኑ ለሰማ ሰው ባይገርም ደስ አይልም። እጅግ በጣም እጅግ አሳዛኙ ነገር ግን በቅዱስ ሲኖዶስ ዙሪያ የሆነው እና እየሆነ ያለው ነገር ነው። ደጉ ንጉሥ ክርስቶስ መፍትሔውን ይስጠን! በመጨረሻም ይኼን የእውነትና የሰላም የደወል ጥሪ ያደመጣችሁ ካህናትና ሊቃውንተ ቤተ ክርስቲያን፣ ዲያቆናትና መዘምራን፣ እንዲሁም ጠቅላላ ሕዝበ ክርስቲያን ጸሎትን እና ልመናን ወደሚሰማ ወደ ልዑል እግዚአብሔር ልመናችሁን አቅርቡ። የእመቤታችን የቅድስት ድንግል ማርያም ምልጃ፣ የቅዱሳን ጸሎት እና የመላእክት ተራዳኢነት ቅድስት ቤተ ክርስቲያናችንን ይጠብቅልን፤ አብሳሪው መልአክ ቅዱስ ገብርኤል የሰላም የፍቅርና በአንድነት ለአንድነት መሥራትን ገንዘብ እንድናደርግ የተለመደ ብሥራቱን ያሰማን አሜን!! ወ ስ ብ ሐ ት ለ እ ግ ዚ አ ብ ሔ ር!! It began as an internet joke with a friend. But then the media - including the Guardian - picked it up, and suddenly he was the Baghdad blogger, the most famous web diarist in the world. Salam Pax describes what it was like to play cat-and-mouse with Saddam's censors. ጦርነቱ አልቆ፣ አማሪካኖች ባግዳድን ተቆጣጥረው ነገር ከበረደ በሁዋላ ያንን ጦማሪ ቢፈልጉ ማግኘት አልቻሉም። በሁዋላ ላይ በብዙ ማግባባት ማንነቱን ዘ ጋርዲያን ደረሰበት፣ እርሱም ራሱን ገለጠ። ዘግየት ብሎ ለእነርሱው ተቀጥሮ እስከ መስራት ደረሰ። ለህይወቱ የሚያሰጋው ነገር ሲመጣ አገር ጥሎ ለተወሰኑ ዓመታት አሜሪካ እስከመኖር ደረሰ። ታሪኩንና ይጦምረው የነበረው ነገር ሁዋላ ላይ መጽሐፍ አድርጎ The Baghdad Blog (ISBN 1-84354-262-5) አሳትሞታል።ወዘተ ወዘተ። ዝርዝሩን ራሳችሁ አንብቡት!!! “እኛ የቤተ ክርስቲያን ነን”!!! የማንም አይደለንም!!! ያለፈው የቅ/ሲኖዶስ ስብሰባ እንዳይሆን ሆኖ ከተበተነና ለጥቅምት ካደረ ወዲህ አጀንዳው መቀዝቀዝ የጀመረ ይመስላል። አንዳንዶች ተስፋ በመቁረጥ፣ አባቶች ላይም ጥርጣሬያቸውን በማስፋት እንዲያውም የሃይማኖቱን ነገር ችላ እስከማለት ደርሰዋል ይባላል። የማፊያው ቡድን ብቻ የያዘውን ይዞ “ጥቅምት እንዳትመጣ ባይጸልዪም” ያኔም ቢሆን ጥቅሙን ሳያስነካ፣ ወንበሩን ሳያስደፍር፣ ዝርፊያውን ለመቀጠል ቀንተሌት እየሠራ ነው። ሕብረትም አለው። ሕብረት የሌለውና አሰባሳቢ ያጣው ለቤተ ክርስቲያን የሚያስበው ወገን ነው። ከዚያውም ቢሆን አንዳንዱ “የአባቶችን ገመና አትግለጡ” እያለ ስለ ማፊያው ቡድን እንዳይወራ በጥቅሳጥቅስ ያስፈራራል። ሌላው ደግሞ እኔን ካልነኩኝ እግዜር በፈቀደው ቀን ይፍታው ብሎ መሽጓል። አንዳንዱ ደግሙ ሲያመቸው ከመዘመርና “ሆ” ከማለት ውጪ ነገሩንም ከመጀመሪያው አልሰማውም። እና ሁላችንም እንዲህ ቁጭ ብለን ጥቅምት ትድረስ? ‹‹ማርቆስ አባታችን እስክንድርያ እናታችን›› ብለን ወደ ቀደመው ድንኳን እንሂድ? ኦርቶዶክሳዊት ቤተ ክርስቲያን የምትመራው በቅዱስ ሲኖዶስ ነው፡፡ ነገር ግን በአሁኑ ጊዜ ፓትርያርኩ ራሳቸውን እንደ ጣዖት ከሕግ በላይ ካደረጉ፣ አንዳንድ ጳጳሳትም ይህን የሳቸውን ፍላጎት እና የራሳቸውን ጥቅም ለማሟላት ቅዱስ ሲኖዶስን ሕልውናውን ለማሳጣት የሚያውኩ ከሆነ ቤተ ክርስቲናችን ቅዱስ ሲኖዶስ አላት ብሎ መናገሩ በዲያስጶራ ‹‹ሕጋዊ ሲኖዶስ›› ነኝ እያለ ምዕመናንን ግራ ከሚያጋባው አካል አይለይም፡፡ እስካሁን ድረስ አባቶች አሉን፣ “ቅዱስ ሲኖዶስ ቤተ ክርስቲያንን ይጠብቃል” በማለት ነበር በቤተ ክርስቲያን ጥላ ሥር የቆየንው፡፡ እንግዲህ ቤተ ክርስቲያኒቱ በውስጥም በውጪም የወንበዴዎች ዋሻ ከሆነች፣ ወዴት እንሄዳለን? ቤተ ክርስቲናችን ለ1600 ዓመታት ማርቆስ አባታችን፣ እስክንድርያ እናታችን ብላ ነው በብዙ ውጣ ውረድ ያለፈችው እና እዚህ የደረሰችው፡፡ አሁን ግን የእረኝነት ኃላፊነታቸውን በዘነጉ ፓትርያርክና ጳጳሳት ያለ አባት እና ያለ እናት ሊያስቀሩን በቀን የበቀል ኃይልን፣ በሌሊት ጨለማት ተገን አድርገው ደፋ ቀና እያሉ ነው፡፡ ታዲያ እስራኤላውያን ወደየድንኳኖቻቸው እንደተመለሱ እኛስ አባትና እናት እንደሌለው ሆነናልና ‹‹ማርቆስ አባታችን እስክንድርያ እናታችን›› ብለን ወደ ቀደመው ድንኳን እንሂድ? ምን ዓይነት ሎተሪ ምን ዕጣ ገጠመህ? በነገራችን ላይ “የቤተ ክርስቲያን ተቆርቋሪው ንጉሴ” መሳሪያ ታጥቆ እንደሚዞር፣ በዚህ ምክንያት ታስሮ እንደነበር ያውቃሉ? For Christians the Sabbath day is a special day. Because of the greatness of what was done for us, Christians, dedicate this day to the worship our Lord who has saved us by grace. Blessing on this day comes from reserving oneself from wickedness. But we, laity of EOTC, in the Diasporas are not very lucky on this. There is always some thing that will ruin this blessed day and forces us to use our brains to think, our mouth to utter and our fingers to write. As we all know the Holy Synod had weeks of dispute that had been settled unfairly and unwisely but I don’t believe it is appropriate to address the Holy Synod unholy as you have said. As an orthodox Christian by now you should know The Holy Synod is called Holy Synod with impartiality. It is the inheritor of the sit of the Holy Apostles there fore it is Holy. It is convention and an agreement to address it in this manner. The appointed head Bishop is called the Holy Patriarch and the rest Bishops. eg Coptic Holy Synod, Greek Holy Synod (United States of America cabinet is called The Cabinet that is naming convention to imply its uniqueness) So it is unwise to call Bishops “ለመንፈስቅዱስ የማይገዙትን አጋልጦና እርቃናቸውን አቁሞ” Surely we can use this on conditions of dogmatic heresy like that of Arius who was humiliated and condemned on the Council of Nicea. “አንብሮተ እዱን አናታቸው ላይ አስቀምጦ በመንፈስ ቅዱስ የሚሾማቸው እና የሚያስተዳድራቸው ..ታላቁ ራስ ፓትሪያርካቸው ነው እነርሱ ራሳቸው የመረጡት ማለት ነው”። On this part you elaborated how the Holy Patriarch ordains Bishops by placing His hand on their heads. My first advice - even though I am no way an expert of Geez but I believe “አንብሮተ እድ” means placing hand or to place a hand so using it in conjunction with “ን አናታቸው ላይ አስቀምጦ” will make you a criminal in the Geeze world as our Fathers would say so I urge you to work more on your Geez before torturing the beautiful Holy language. My Second advice and question comes after this statement you made seconds after the phrase I quoted above “እግዚአብሔር ሳይፈቅድ በመንፈስ ቅዱስ ሳይመረጥ የስልጣን ጥመኛ ሆኖ የሚገኝ አባል …” the rest I will not rephrase since it is unethical and unmanned even to quote. So according to you initially you said Bishops are appointed and ordained by the Holy Patriarch with the help of Holy Spirit so are you telling us the same Holy Spirit you mentioned makes mistakes(God Forbid) in appointing its ambassadors or are you telling us the Holy Patriarch makes mistake or even get backhander and bribes to appoint Bishop “ በዘመድ በጓደኛ በብልጣብልጥነት በራስ ፍላጎት ሰርገው የገቡ”.. So are you telling us the Holy Patriarch is corrupted enough that he sits ion the Holy chair and appoints Bishops based upon relationship and personal favor and self initiation. Ato Nigusse your program has been full of contradiction please listen to it again and give your opinion on this I will present and reveal to you the rest and the final conclusion as God permits, tomorrow but I want you to be very care full on how you address the Holy Patriarch because some of your view are serious accusations that could led you great crimination in the face of both the Church and Social law. For your information, follow this link about Negussie W/Mariam. • የቅዱስ ሲኖዶስ አባላት የቤተ ክርስቲያኒቱን ሕግ ያውቁታል ወይስ አያውቁትም ? • የቅዱስ ሲኖዶስ አባላት ያለባቸው ኃላፊነትስ በትክክል ተረድተውታል ወይ? • ከዚህ በኋላስ ሊቃነ ጳጳሳቱ በምን ሞራል ነው ልጆቻቸው መባረክ የሚችሉት? • ለቤተ ክርስቲያኒቱ ህግና ሥርዓት ተቆርቃሪዎች እውነተኞቹ ነገር ግን በቁጥር ትንሽ የሆኑት የቅዱስ ሲኖዶስ አባላት እንዴት ከሕዝበ ክርስቲያኑ ጋር ሊገናኙ ይችላሉ? የፓትርያርክ ከስልጣን መውረድስ ህገ ቤተክርስቲያን ምን ይላል? ማክሰኞ ሰኔ 30 ቀን 2001 ዓ.ም. ረቡዕ ሐምሌ 1 ቀን 20001 ዓ.ም. ሐሙስ ሐምሌ 2 ቀን 2001 ዓ.ም. አርብ ሐምሌ 3 ቀን 2001 ዓ.ም. ሰኞ ሐምሌ 6 ቀን 2001 ዓ.ም. ዕረቡ ሐምሌ 7 ቀን 2000 ዓ.ም. The DS team would like to thank each and everyone of you for your attentive follow up of Church developments for quite some time. God willing the issue seems to reach another stage, which needs our cummulative service for the betterment of our religion. In the mean time, some readers went out of line and write non-dejeselamawi comments, that offended many of us. Thus, from now on, all comments will be moderated, unwatned ones will not be allowed, and those of positive sentiment will be given the chance. እስቲ ቸር ወሬ ያሰማን እንበላ!!!
. As usual Ethopiafirst and Hager Fiker are announcing the verdict! The issue , raised in the Holy Synod assembly has been going back and forth for the several weeks with controversial decisions and resulting in the assault of the Arch Bishops, has ended by hearing and fully accepting the course of action of the holy patriarch. On the assembly held today, the Patriarch had been full in control of the strength and led the meeting in his way. He has verbally said “I accept” the Canon of the Church which he has called a ‘Vagabond deed” on yesterday’s meeting. Abune Kyrllos’s home has not been fixed. The mafia group and the invisible hands of Aba Paulos has caused a great psychological pressure on the fathers. Abune Estiphanos, who played a great role in diverting the meeting principles, made the fathers to sign the agreement as soon as possible. A press release was given and acted as if “Peace has been accomplish”.Some have commented that “Abune Estiphanos,Abune Muse,Abune Gabriel,Abune Yisak,Abune Gorgoriyos had been the right hand of Abune Paulos and have defied the impartiality of the Holy Synod and have destroyed the Church”.By government ,that has initially declared that it will accept the decision of the Holy Synod,Abune Paulos is believed to start his revenge on all who have stood by the Church’s canon and rites. Here you have two interesting articles. Article 1 is written by Dan, and Article 2 is by Matiwos. Enjoy. I have tried to follow what is taking place for some times but with regards to the synod what I find amusingly or sadly strange is not knowing, particularly in the last three or more synods. What is the total number of the bishops? Are they all members of the synod? Was the meeting the General Synod or permanent synod, if there is one? How many of them attend this synod? Do they have OBLIGATION to attend? What is the quorum for the meeting to take place? Did the synod discuss the issues, heard HEARINGS? Who voted for (again not knowing what the issues brought to the meeting) and who voted against? What is the vote number for yes and no? In Matthew 5:24 we read “leave your offering there before the altar and go; first be reconciled to your brother, and then come and present your offering. Ours like to be different and like a monarch with a crown. In contrast take a look at the life and service of Aba Shenuda, the patriarch of Egypt. He is Obedient to Christ, his Church the people of God. His is loved by his people as a Disciple of Christ. Look at his joy in being among his people, look at the seat he takes, a simple pew –wooden bench, unlike aba Paulos who require a throne. You hear Shenuda CRY FOR HIS CHURCH AND PEOPLE. 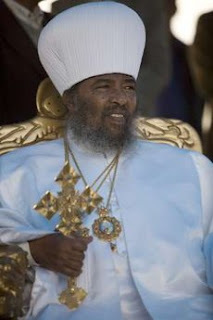 Has anyone witnessed aba Paulos with such humility and spirituality (For that mater do any of the Ethiopian Bishops?)? In other churches bishops stand with their people & serve their people, ours get serviced by the church people; serve the rich and those with power. WE SHOULD PRAY. We should pray to Christ so that our action is guided by his words. In action is not acceptable at times of crisis. In the name of the Father, and of the Son and of the Holy Spirit, One God Amen. Mr Dan, by the Will of God, I am member of the Ethiopian Orthodox Tewhadeo Church. Concerning your comment: "Also NOT ALL orthodox churches call their Patriarch “Holy”. Under the current circumstance it is a mockery of the word Holy and ridiculous to call the current patriarch “Holy”"
My reaction to this is: the reason the EOTC calls the Patriarch 'Holy' is because the seat/position (Patriarch) he is occupying is the Holy Seat of Saint Mark, the first Patriarch. In addition, you mention, "I think they should be addressed as “Your Beatitude, "Your Grace", or Your Eminence." Yet you address the Patriarch Bitsue Abune Paulos as, "aba Paulos". Again, addressing the Patriarch has nothing to do with his personality, its because his POSITION demands it. Yet again, "Yes Egyptians were not good for our church and us. That is our Weakens, which we still exhibit 50 years after we free ourselves from their rule." My question to this statement is, is it our weakness that the Egyptians for 1600 years did not contribute to the real development of the EOTC to be self sufficient? Is it our weakness that the Egyptians demanded an excessive amount of $$$ in gold, elephant tusks, etc, for them to send our Bishops, is this what is called 'spiritual'? ; is it our fault that Copts did not take Ethiopians to Egypt and train them their language, as well as Church canons and dogma, so we could communicate with them better? Do we know for certain the EOTC fathers at the time of Copt 'leadership' did not attempt to have autonomy, which is a sign of strength? I tell you they did, but were refused because they were not seen worthy!!! And this feeling of 'holy' superiority complex still exists among them today. There are books that can help us see this, we can start with the late Abune Gorgorios' book on Church History. Again, nothing against the Copts, they have done an amazing job with THEIR OWN CHURCH progress, but when it comes to the EOTC, their contribution is questionable and this cannot be ignored as history can attest to this truth. Two more things I would like to bring to attention. One is that the EOTC is young in terms of administrating its own affairs from top to bottom. This means there will be mistakes along the way of our growth. If we research the development history of ancient Churches like Copts, Rome, Greek, Russian, we will find out they had similar issues, and at times worse situations, this is part of growth. The question we as EOTC servants should ask is how is MY service to the Church looking? What is God's expectation for me? What do others expect from me? The whole point is for us to look within ourselves in order to know who we are in relation to our relationship with God. Which brings me to my last point, it is terrible to compare the fathers of the EOTC with the Copts, first of all its not Christian to reveal another persons weakness openly like this. Our fathers should not be subjected to our judgments, let lone our Bishops and Priest, who have the position of leadership in the Kingdom of God, we should not place judgments on ANY soul. Our Fathers have been given their position by God, He will monitor their affairs. We are not the boss, He is. The responsibility of the laity/meamen, is serving God in what ever capacity given to us, along with RESPECTING our fellow workers of the Kingdom of God. In short, lets know our place if we want to work within the Kingdom of God and please God. Lets concentrate on OUR OWN responsibilities within the Kingdom, judgment is only reserved to the King and ruler of the Kingdom of Heaven, God Himself. Lets not squander our calling by straying away from the Word.